This appears to be fresh out of Iran via BBC Persian. It appears to show Basij militia firing on unarmed protesters. It’s pretty raw footage, so viewer discretion is advised. A 6 minute graphic video with music. Some very graphic scenes. It portrays the first week or so of protests. It is interesting: all recorded by amateurs, produced and edited and put online for the consumption of the entire world. Total monetary cost: next to nothing. Amazing world we live in. The Guardian have a story that George Bush will establish a US diplomatic mission in Tehran for the first time in 30 years. The Guardian has learned that an announcement will be made in the next month to establish a US interests section in Tehran, a halfway house to setting up a full embassy. The move will see US diplomats stationed in the country. The return of US diplomats to Iran is dependent on agreement by Tehran. But president Mahmoud Ahmadinejad indicated earlier this week that he is not against the opening of a US mission, saying Iran will consider favourably any request aimed at boosting relations between the two countries. He has his legacy to think about I guess. 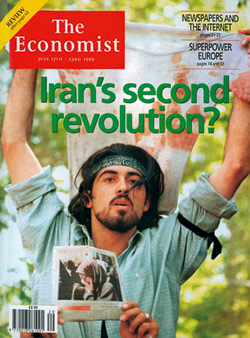 In July 1999 the man on this cover of the Economist, Ahmad Batebi, was arrested by Iranian authorities. He was tortured and told he would be killed. During his interrogation he was blindfolded and beaten with cables until he passed out. His captors rubbed salt into his wounds to wake him up, so they could torture him more. They held his head in a drain full of sewage until he inhaled it. He recalls yearning for a swift death to end the pain. He was played recordings of what he was told was his mother being tortured. His captors wanted him to betray his fellow students, to implicate them in various crimes and to say on television that the blood on that T-shirt was only red paint. He says he refused. Looking at the picture that sparked his ordeal, he says that another man in his place might be angry, but he is not. Mr Batebi is a photographer himself. He says he understands what journalism involves. Had we not published the picture, he says, another paper might have. Looking at the same picture, his lawyer, interpreter and friend Lily Mazahery says she is close to tears: in it, the young Mr Batebi’s pale arms are as yet unscarred by torture. The protests Mr Batebi took part in nine years ago frightened Iran’s rulers. The students were angry about censorship, the persecution of intellectuals and the thugs who beat up any student overheard disparaging the regime. Mr Batebi thinks Iran could well turn solidly democratic some day. In neighbouring states, religious extremism is popular. In Iran, he says, the government is religiously extreme, but the people are not. I look forward to an account of his life and his escape. Back to Iran again. Geoffrey Kemp writing in the National Interest is hoping that for the sake of America’s interest, Israel is not planning to strike Iran. Could or would Israel try to drag the United States into such a confrontation? The answer is no, unless this is what the Bush administration wants to happen. The indications are that while some White House advisors may still contemplate such an action, it would be far more difficult to convince the secretaries of defense and state that another Middle Eastern war would serve American interests. As was brought up yesterday, if Israel were considering a strike, they could wait until the near end of the Bush lame duck administration, and the beginning of an Obama/McCain one, thus avoiding the issue Kemp raises above. What's going on with Iran? Mr Hersh is talking about Iran again. Kevin Drum points to a good Q&A by Laura Rozen over at Mother Jones. Danny Postel points to this interesting piece in the Economist. It does not make for pleasant reading. After Israel’s recent practice run for bombing Iran, the newspaper concludes that they may not be bluffing. It may well be true that Mr Bush is disinclined to bomb Iran now that he is a lame duck, but the possible advent of a President Obama might just make Israel more inclined to do so itself. As the hawkish John Bolton, a former Bush administration official, said this week, Israel may think the best time to attack would be during America’s presidential transition—too late to be accused of influencing the election and before needing a new president’s green light. Author Gavin SheridanPosted on 30th June 2008 Categories Iran1 Comment on What's going on with Iran? Everyone knows that Cheney’s fondest pipe dream is driving a bulldozer into the New York Times while drinking crude oil out of Keith Olbermann’s skull. It looks like deadlock. We will have to wait and see. A UK diplomat said the EU3, the foreign ministers of the UK, Germany and France – had not heard anything new. The Iranian official, Javad Vaeedi, cast the talks in a positive light and said he hoped the talks would continue. The UN’s nuclear watchdog, the IAEA, is meeting in Vienna on Thursday and could refer Iran to the UN Security Council for possible sanctions. Diplomats from EU3 plus the US, Russia and China are meeting for dinner in London on Monday evening to try to agree a common stance ahead of the Vienna talks. IAEA head Mohamed ElBaradei told Newsweek magazine that after three years of intensive work, he is still not able to conclude that Iran’s nuclear programme is aimed purely at energy creation rather than the manufacture of nuclear weapons. “If they have the nuclear material and they have a parallel weaponisation programme along the way, they are really not very far – a few months – from a weapon,” he said. With the US military stretched, how can a military option be considered. Special forces/air strikes, combined with a trade embargo, seems like the only options. And when Bush says he is seeking a non-military solution, is it the same as when he said the same during the inspections in Iraq in early 2003?